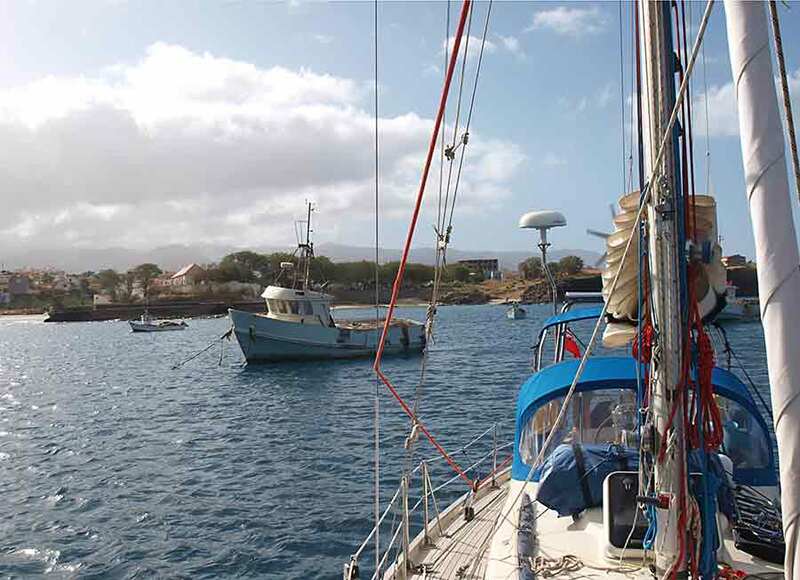 We left Mindelo on Friday afternoon - not an auspicious day for setting sail. 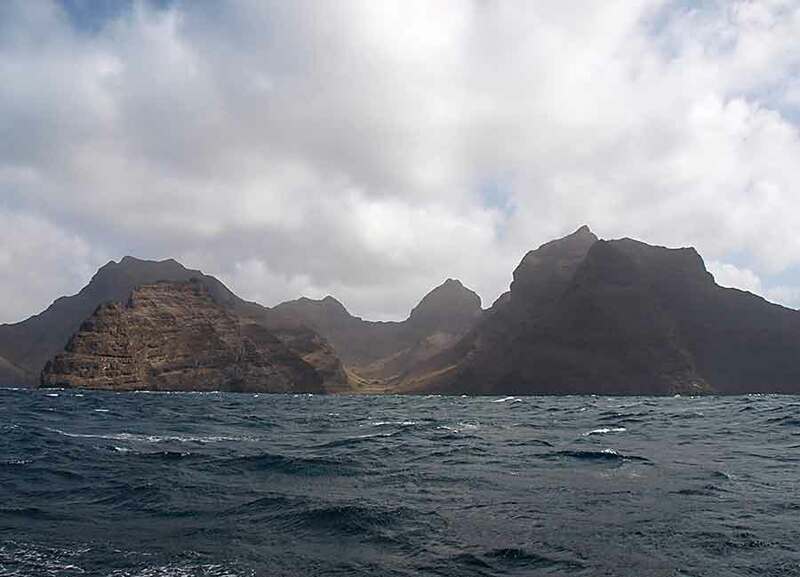 The weather forecast predicted strong northeasterlies and we departed with a favourable tidal stream so we had a fast but sheltered downwind sail around the southwest corner of Sao Vicente, a barren but fascinating coastline. 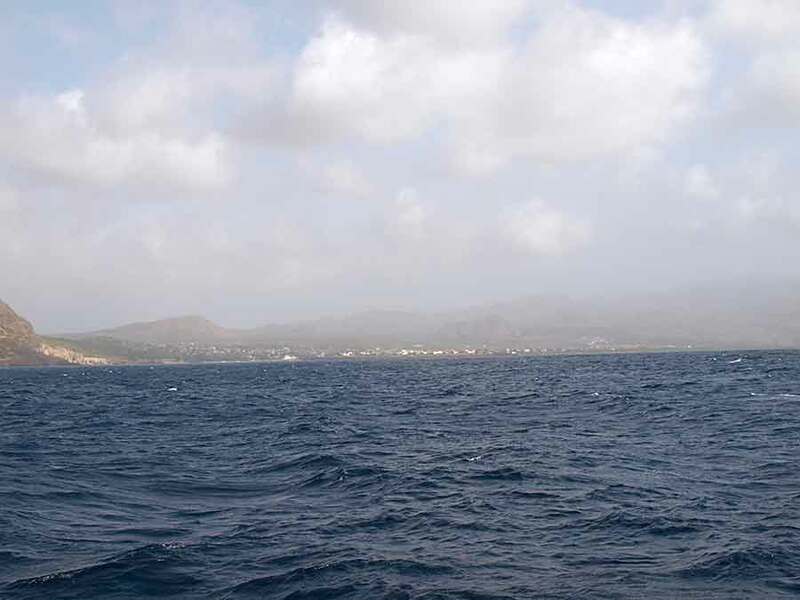 Once away from Sao Vicente, heading southeast towards Santiago island, we might have expected a beam reach, but the ocean current which runs south west in these parts had been increased by the strong trade winds to about 1 knot, meaning we had to sail a close reach or fetch. Our passage through the night was fast and wet in Force 5 to 6, gusting 7. 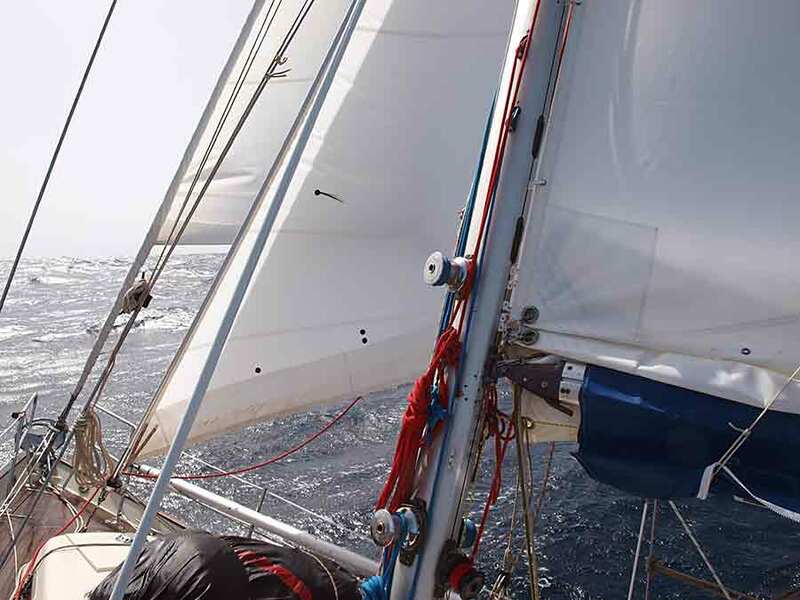 We opted for comfort rather than speed with triple reefed main and staysail, adding a well reefed genoa in the less windy periods. 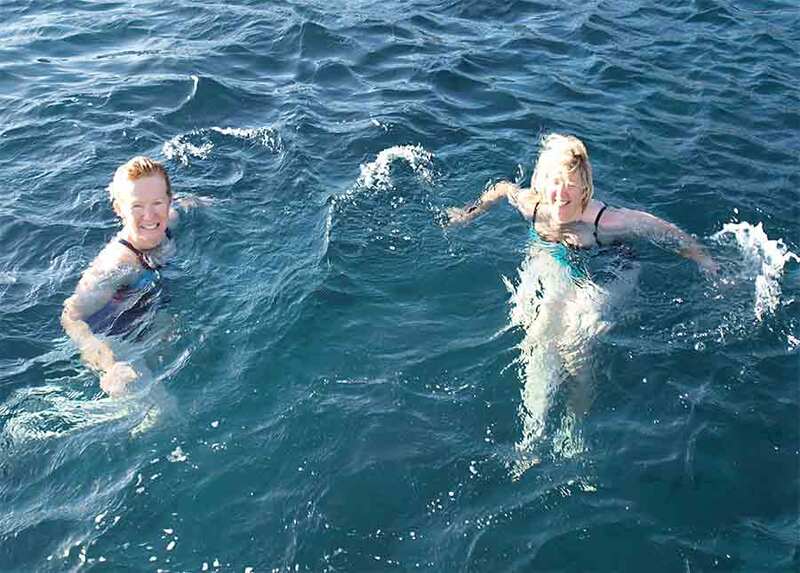 Although the temperature was well above 20 degrees, the wind chill factor and regular waves dumped on board meant we had to be fully togged up. Actually Aries is doing the work! Visibility wasn't great so we couldn't see Santiago until fairly close in and we arrived at the Bay of Tarrafal in the late afternoon. There were a few other yachts at anchor. We picked a spot inshore of them and had a good night with only minimal ground swell (which can be a problem in most anchorages in the Atlantic islands). After several days of strong trade winds the atmosphere can become dusty! 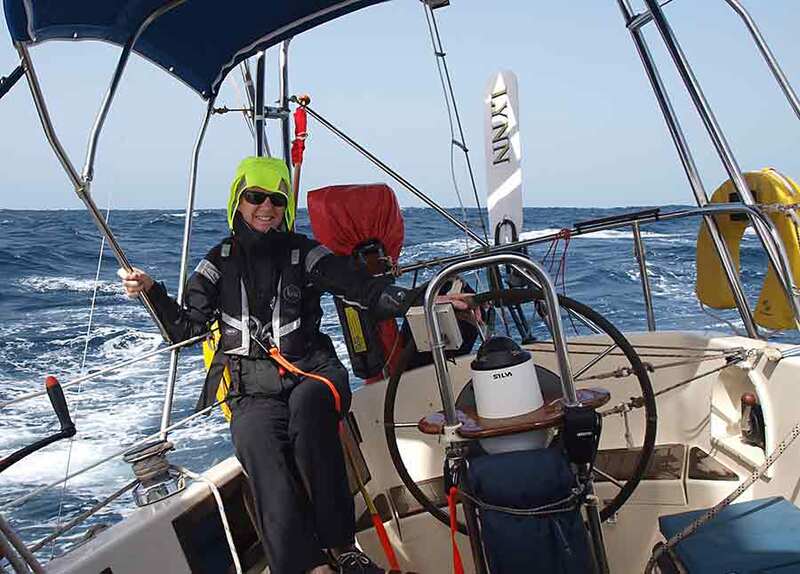 On Sunday we sailed down the west coast of Santiago. 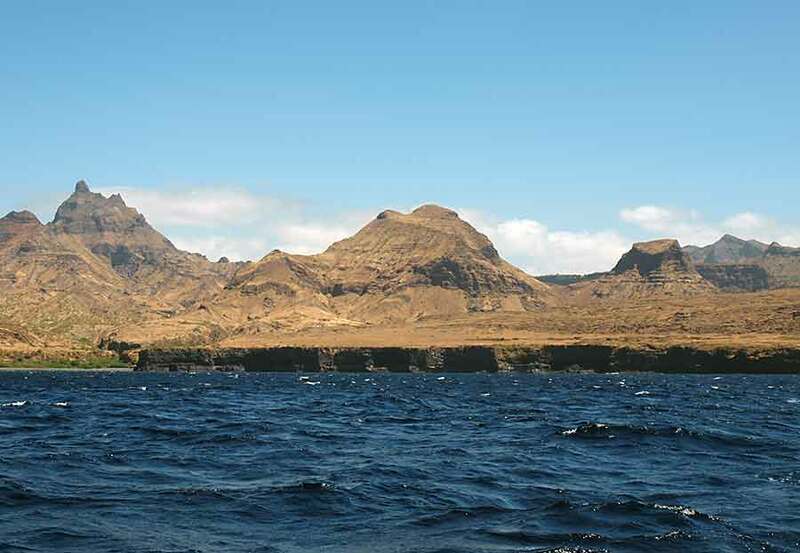 The coastline varies from green valleys with settlements of various sizes, including fishing villages, to stretches of barren but dramatic scenery. 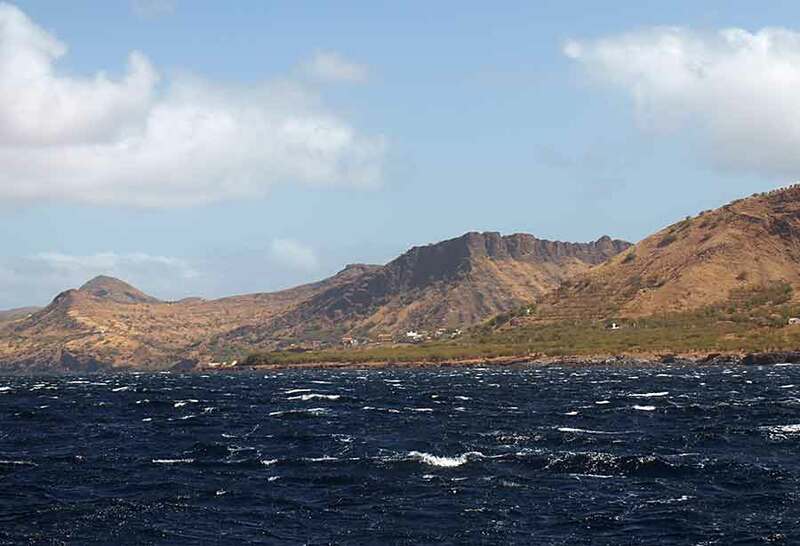 To the west we could see the peak of Fogo island, an active volcano some 40 miles away. 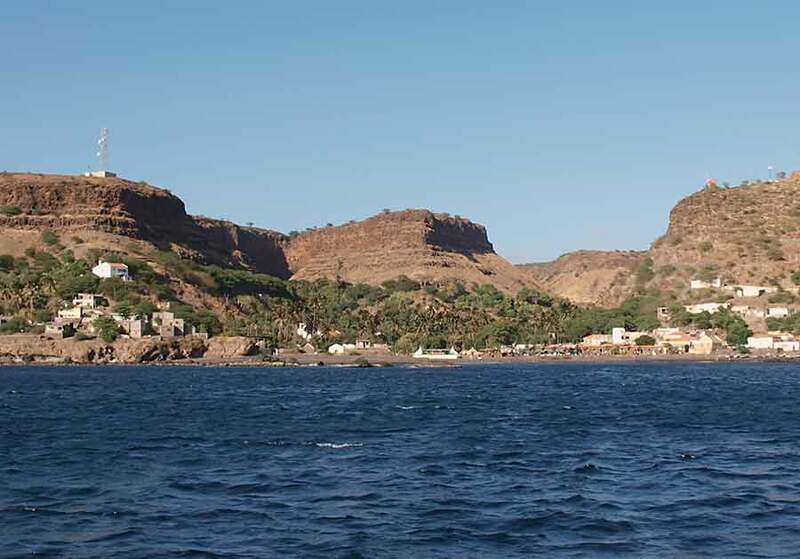 We checked out an anchorage called "Inferno Bay" but decided it wasn't worth stopping so continued on to Cidade Velha, not far from Praia, the capital and main port on Santiago. By this time we were motoring having lost the wind. Has someone been learning origami? 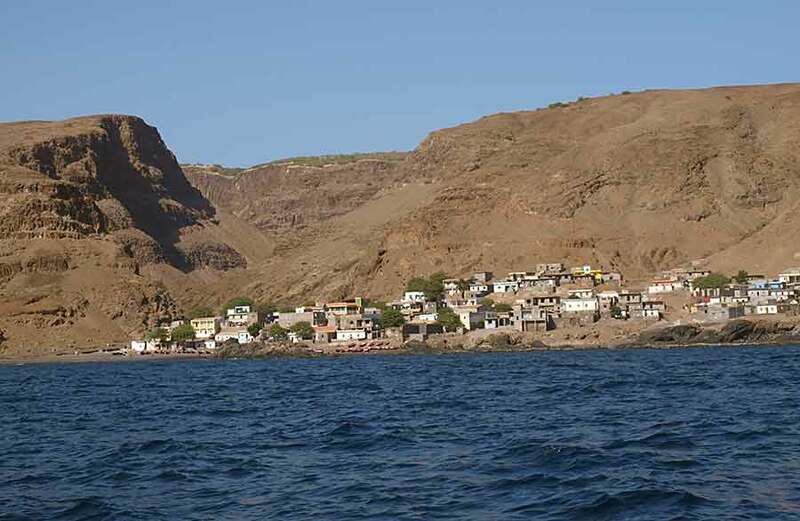 Tiny coastal village called Mosquito - no, we didn't check the veracity of the name! Cidade Velha is a small town on the site of the original settlement on the island. When we arrived the town was pulsating to the sounds of a steel band. Fortunately the best anchoring spot is away from the main beach so the noise level was tolerable. With little wind we were feeling warm and the water is crystal clear so we all had a swim - with Paul ("I can't swim") leading the way. It was our first swim in over 3 years and felt very good indeed. From Cidade Velha to Praia is just a short hop. 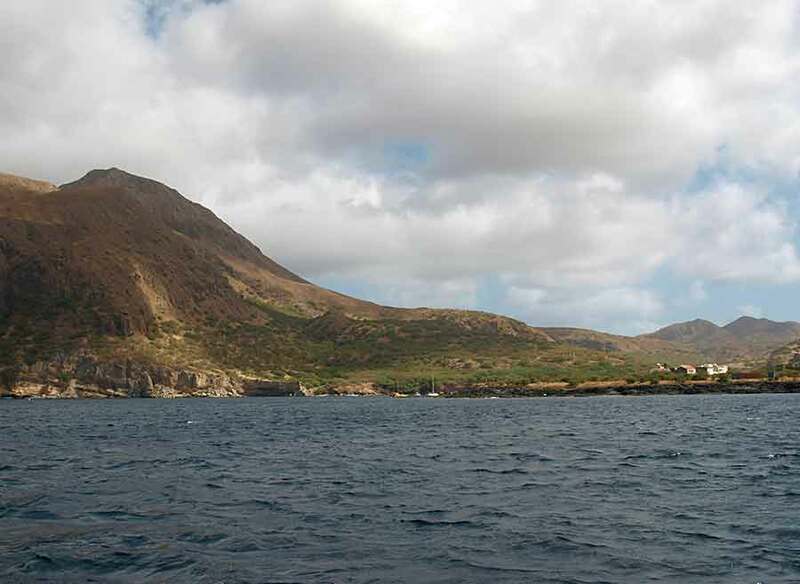 On the way we took a look at Calheta de Sao Martinho, a small anchorage that looks promising for future use, but this time we decided to press on to Praia.